Hands down by his sides, this custom casual boy bobblehead doll is wearing a black strips hoodie with blue jeans. 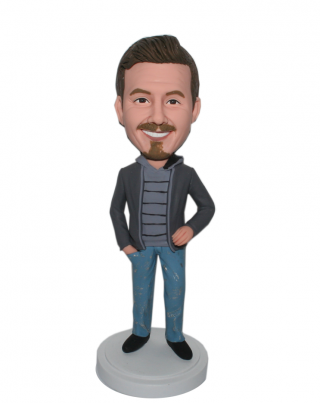 This customized bobblehead is uniquely made for the hoodie lovers. If you have a friend whose always wearing his favorite hoodies is just like this, then he really deserves this custom bobblehead.Also,By this bobblehead, he'll feel the sincere friendship between you and thus will cherish it more and more.